The Pearl 80 is the Queen of Gems! A class-defining line of yachts! : Atlantic Yacht & Ship, Inc. The Pearl 80 is the Queen of Gems! A class-defining line of yachts! Atlantic Yacht & Ship, Inc. is the exclusive U.S. dealer for Pearl Motor Yachts. The new Pearl 80 is available now at our Dania docks. Reflecting our owners needs and desires, the Pearl 80, brings together sumptuous space with luxurious styling and outstanding levels of comfort. This class-defining yacht has a flybridge perfect for entertaining. Equipped with a BBQ, wet bar, ice maker/drink fridge, hot tub and enough seating for the whole group. We love her hardtop electric sunroof that provides a stunning view and sets the mood for any event. Additionally, with a hydraulically operated bathing platform and hydraulic jet ski garage, the Pearl 80 makes water adventures a breeze. She has a top speed of 35 knots and a 2 year warranty. A brand new, 80′ yacht, under $4 million, in Florida with duty paid! 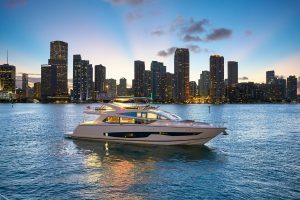 She has grabbed all the attention since her debut at the Florida International Boat Show in October. As well as, her private media event at the Epic Hotel in December. Her next show case is the Miami Yacht Show February 15-19, 2018. She will be displayed at The Pearl Motor Yachts booth located North of Entrance 4 at the 4600 Block of Collins Ave. For more information, click our Events Calendar. In fact, contact Randy Kires at Atlantic Yacht & Ship, Inc. for more information on Pearl Motor Yachts.